The Town of Tiburon is located just north of San Francisco. It is accessible by ferry from downtown San Francisco, as well as by car from Highway 101 and Highway 131. Tiburon features numerous small boutiques and restaurants, catering both to local residents and to tourists. Most of the town’s restaurants are located on or near Main Street, near the ferry landing. On Friday evenings in the spring and summer, the town’s Main Street is closed to vehicles and transformed into a large alfresco dining area for “Friday Nights on Main”. Local restaurants and bars provide outdoor dining and drinks, with music and lively crowds helping create a festive atmosphere. 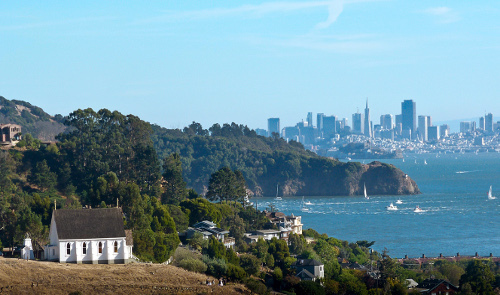 Tiburon and its homes have some of the best views of SF in the bay area!